as my lvl getting closer to hunt at nightmare clock tower, I was wondering if I have to upgrade my gear for better hunting speed at nightmare clock tower. Honestly, I thought I have decent gear on me, but while I was doing my verus daily, I met a Warlock who does 150k damage with a chain lighting per ticks. and I asked him what kinda gears does he wear then he answered that he is only wearing survivor set. So I was wondering if i get survivor set, will I be do more damage in overall? Only buff i uses is Increase Agi 3, Vip Buff, and berserker pot. and I usually do 25k to 30k with chain lightning per tick, and 3~40k with crimson rock, and 2~2.5k damage with soul expension at verus field. P.S: my flattery is only 150 prontera marks away. Survivor set is what you need. It will boost your leveling time greatly. Use earth strain and reading spell book (store earth strain skills) to one shot everything in NCT. 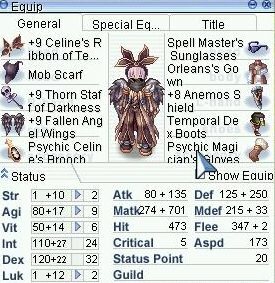 for accessories: you can opt for PDM plus any good accessory with int or matk boost plus elvira cards for both acc. Thank you for the answer, I will definately try the survivor then. but is PDM worth for the warlock tho? 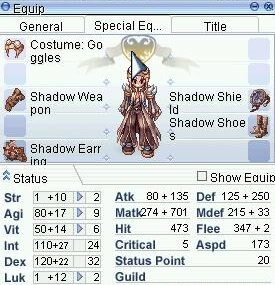 Survivor Shoes already give you 50% mdef pierce, you can initially just use magician gloves to obtain that 100% mdef pierce. PDM is better for endgame to boost all stats. For mid gear which is better, weakend fenrir +25 m attack or the elemental damage increae card such as tikbalang +10 m attack +5% wind magic damage if using CL, yellow lichtern if using soul expanansion? Elemental Lichtern and Tikbalang have better odds in boosting your specific elemental spells damage than Weakened Fenrir.